Discussion in 'Guitars in General' started by DVHStrat, May 6, 2016. Can't post pics at the moment. It's standard with the vibrato piece. 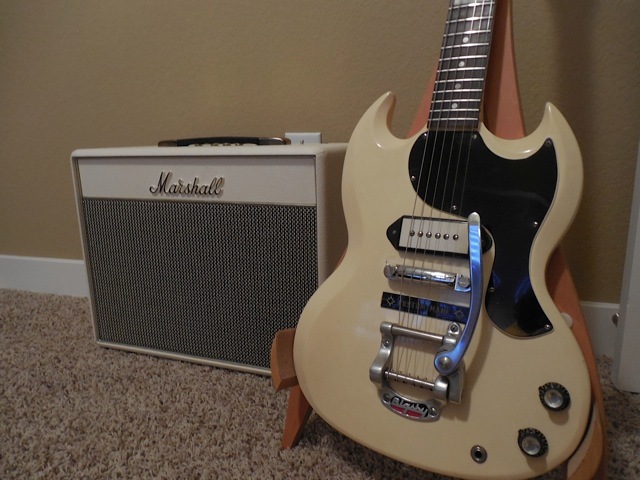 If it's a real 1963 SG with humbuckers, are the pickups original or have they been replaced? Hmm, seller is looking to get at least 7k and that does appear to be about market value. 4k because of the neck reset? These guitars rarely need neck resets. The often need neck repairs. That's a big discount. Southworth has a spotless '63 for 9k. That's the absolute top, and I bet he'd go lower. So yeah, with the details given. 4k, maybe more, maybe less. This may reduce the sale price but my perspective is that this is actually a plus, not a minus in terms of the guitar being usable. I've seen early 60s SG's that neck shift had rendered completely unplayable. Seriously doubt you can get a good guess without picts. Road weathered '63(s) don't garner the coin that mints do. I have one point of reference for you to work with. The '62 you see below was the center of a bidding war that got laughed out of the room when the bids topped out at $10K (Class 5 Marshal not included). After I played this baby, I knew why the owner wound not settle for $10K. Keep in mind that this guitar is so well preserved, it is kind of "spooky". What's with the pickup cover? No way that thing is a 10k dollar guitar. Crazy to pass that kind of cash up, if that's true. I'll stick with my 4kish, maybe less. Need gut and repair shots. It's funky. Bridge pickup, at the least, is not original. Seriously? How do you tell? The "T" on the top is a dead giveaway. Anyway, I guess the sellers expectations are unrealistic. Thanks guys! T top pickup. gibson introduced it in '67, they lasted through the 70's.... They have a T on the top of the bobbin, hence the name. 1963 SG was actually called a Les Paul then... It was renamed the "SG" later on in the late '60s.. It meant "Solid Guitar"
Laughed out of the room? That seller is insane. Not worth anywhere near that much. Not even mint with that pickup cover and whatever is below the bridge? I've watched similar for years and I wouldn't pay more than 5k for what I've seen truly mint similar ones goes for.